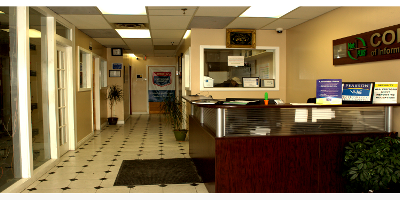 Our Climate Controlled facilities are located at 880 Ellesmere Road Unit 106 F in Scarborough Ontario at the corner of Kennedy and Ellesmere just south of the 401 freeway. We have an in-house testing facility to accommodate vendor certification testing. Our state-of-the-Art electronic appliances include industry proven 2900, and 1900 ISR routers, 3500 X series Switches, 5512 X Series Firewalls and virtualized Palo Alto Firewalls to ensure our students our getting hands on experience with some of the most modern electronics. We employ a Voice Over IP Lab complete with Cisco IP handsets to go along with industry seasoned instructors with full vendor certified credentials who are eager to answer any questions you may have. Our three Microsoft/Cisco lecture classrooms each contain 16 PC’s, with up to date processing power and plenty of Ram with SSD drive capabilities to ensure no time is wasted setting up virtual lab environments. Our Conference room gives students a place to collaborate as well as being used for CCNA Collaboration classes. Parking is a breeze with onsite no-charge parking, also the TTC Transit system is a great way to arrive at the College with the closest stop a 2-minute walk.